The simple question that has made me stop and think. What is the why? I write not because of a “why.” I learned that I write for a need that must be filled. Without writing in my day, I would feel empty, confused, and wandering without purpose. One day, while pondering this question, I tried a little experiment by not writing at all. I could not write electronically or with any writing utensil. I could not respond to texts, make lists, write down information I was learning or information I needed to produce. I could not make a record of anything I learned, I thought, or I created. I assumed the day would pass with all of the items I needed to accomplish at home. There were a few errands to run so there would not be a tremendous amount of writing required for that day. I could return phone calls instead of texting. No problem. It was not like I was at work where writing was needed. Little did I realize how much writing impacted my life. A couple of friends texted me, and I called them back with one ending the phone call saying “just text me tomorrow.” As the day progressed, we went on a hunt for new flooring options. That was ridiculous. I could not remember prices, materials, qualities, or dimensions. My husband became so frustrated that he began recording information. To make sure I did not write, I left all the paper and pens at home. There was not a single thing in my purse to record information. I did feel lighter but served no purpose. I started taking pictures of details until I realized that technically that was a record of my thinking. At one point I almost resulted in getting out a tube of my favorite lipstick to capture information. By mid-afternoon, the experiment was over. I had not gone 8 hours without being able to write. I bought a pen and a small journal to finish the day. I always envisioned myself the kind of writer that would have books filling the shelves of homes across the world. I would be a writer that would inspire others with my words. I would be like my favorite writers, Maeve Binchy or Isabel Allende, with best sellers that would be translated into multiple languages. I would be the writer where my stories would transport the reader to a land where present time did not matter. Now, today, I am the writer that supports me. I am the writer that finds peace and calm in her world by putting words down on paper. I am the writer that teaches others to write. I am the writer that confers with teachers and students on how to use writing to make a difference in their world. I am the writer that sees her students succeeding in multiple arenas of high education and the workforce. I am the writer that writes daily just like breathing. The letters began with an off-hand comment between two business associates. “I’m taking my family to Washington, D.C. to celebrate the Bicentennial.” My dad tossed the thought out onto the pile of small talk after a meeting. On the plane home, Bill Palmer grabbed a legal pad from his overstuffed briefcase and penned his first epistle to my father and our family. It was an eleven-page summary of the sights to be seen and bargains to be had in our destination. This was Bill Palmer’s way, and the beginning of a thirty-year friendship recorded in letters. Bill had a room upstairs in his Hollywood home he had claimed for his own, safe from the maid and his wife’s attempts to organize him. Wide windows opened onto a view overlooking the city below. Souvenirs from his travels, mementos of his children, plaques and awards from work, and Indian artifacts filled a wall of bookshelves. The other walls of the room wore a mural of family photos and favorite Republicans. In the middle of the room stood an old, scuffed desk, wood warmed from years of use. An old coffee mug labeled “World’s Greatest Dad” held pens pilfered from various hotels, with the matching notepads and the day’s newspapers scattered nearby. Photos of his son and daughter and his beloved Charlene, still his starlet after all these years, faced his chair. A miscellany of boxes held Indian arrowheads and a collection of odd stamps. Here in this cluttered sanctuary, he wrote the letters that became such treats to his friends. Sitting in the creaky chair, he read the day’s newspapers with scissors ready to clip a coupon or a sports score as the need arose. He read with friends and family in his mind, peering at the words through their eyes. A newspaper article, an editorial cartoon, even a restaurant advertisement might trigger a sudden thought of someone special. When something caught his eye and started his heart to thinking, he quickly clipped, then snatched the nearest hotel pen and pad and wrote—real letters, communication safe from the intrusion of text messages, emails, and the electronic shorthand they generated. His large, strong hands struggled to keep pace as his quick mind raced through advice, inspiration, encouragement, and laughter. Though angular and crisp, his forceful handwriting had a conversational grace that drew the lucky reader along from word to thought to joke. Red ink might pop in to emphasize an idea. Anticipating his reader’s comments or laughter, he might physically pause in the letter, and then continue with his own wry humor. Letters to my dad usually included a sports clipping detailing the latest battle of his high school alma mater or an editorial cartoon reflecting their shared irreverence and sense of the absurd. Bill’s letters were concrete, elegant reminders of, “I thought about you today and wanted you to know.” Although impulsive bursts of friendship, these letters were masterpieces—bright strokes of word and deed. Once written, these masterpieces deserved proper frames. The box of stamps on his desk held a variety of values, colors, art, and themes, all purchased in bulk from a discount warehouse on the East coast. He carefully selected a hodge-podge of stamps, exactly totaling the day’s fare for a letter’s journey, and each with a special message for the recipient. My father’s might have included great personalities from jazz, history, or sports. Addressing the letter might include hand-written asides, comments on the stamps, or clever nicknames the postman must have hated deciphering. I picture Bill carrying the letters to the mailbox and raising the flag, satisfied with the results of this daily, deliberate chaos. The post office must have had a time counting up the pennies in each stamp. But the letters flew across the country, landing in mailboxes and delighting friends. The whole family knew a Bill Palmer original and shared the event of its arrival. When my twelve-year marriage ended and my daughters and I were finding our new path, I received my own original Palmer. Instead of a random clipping, the news from my father of my finalized divorce generated a letter to me. The impulse to comfort, encourage, and inspire hope sent Bill to his desk. I had never met him but knew his letters well. When I found my own letter addressed in that firm handwriting and decorated with brightly colored stamps, I pulled it reverently from the mailbox. On my envelope, stamps cried out, “Give me liberty or give me death,” celebrated the American woman and love, exhorted us to swear “hostility against every form of tyranny over the mind of man.” Bill added a bright red “and women” to Thomas Jefferson’s quote. The thoughtful words were written on a card depicting a 19th century U.S. cavalry victory with a Teddy Roosevelt-like lead rider. Bill called my new life “bright, grand, and glorious.” I could hear his own battle with cancer in his urgent advice to cherish my children, celebrate my family, and live each moment of life in hope. I determined to follow his advice. One fall shortly after, the letters stopped coming. We knew the scissors lay still, the stamps undisturbed, and the pen silenced. There would be no more delights in the mailbox. The lost art of letter writing may have died with Bill Palmer. Bill wrote letters to honor his friends and to communicate his commitment to them across miles. He wrote letters to celebrate the people he loved and the things they cared about. He wrote letters to connect. His dedication to the art and purpose of letter writing nurtured friendship across the miles and over decades. My father still has a collection of his letters, including the epic that began their friendship, and I treasure mine. In an age of electronic abbreviations, Bill Palmer sent pieces of his heart with each scrap of newsprint and sealed his letters with good wishes. Our hearts were filled, faith renewed, and hope inspired. Shopping for a new writer’s notebook always takes time. It’s not easy to find just the right one: the right weight, the right cover, the right feel of the paper and look of the lines on the page. When I was in junior high, a package of loose-leaf was my favorite choice for writing. At back-to-school sales, Mom would buy reams of notebook paper, and it was perfect for my creative efforts: no page count limits, no chad-messy margins, no stiff binding to limit the movement of pencil and pen across the page. Loose-leaf paper offered fresh starts, a seemingly endless supply of them! A new day with new ideas? Just grab another stack of paper and get started. College-ruled was best for creating rosters of starship crews and planning their voyages into space, that final frontier, always with a captain who was strangely similar to James Kirk. Wide-ruled paper was best for drawing the floor plans of the ranch houses my fictional families lived in, families that always had a girl in them named Jamie or Jodie and a neighbor strangely similar to Ken McLaughlin, complete with a horse named Flicka. Planning what I was going to write was as much fun as the writing itself, each blank page holding the promise of escape into another time and place. Not a word of the writing that came before was there to remind me of abandoned efforts or unfinished ideas, and each new writing project seemed like it would be the best one, the one I’d take to completion. I wish I still had those loose-leaf pages from decades ago, but of course, they are long gone. I didn’t start using composition books until after I became a teacher. 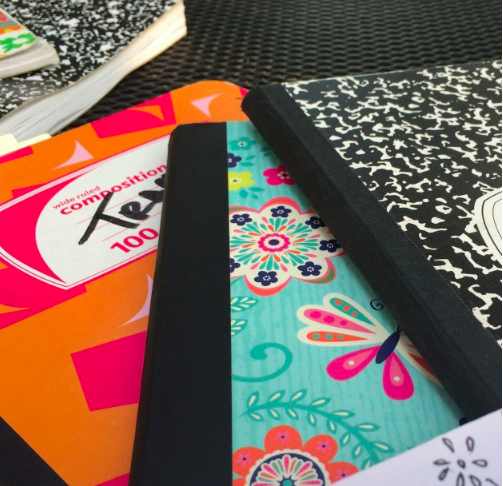 I soon found that it was easier to manage 150 uniformly sized writers’ notebooks than it was to collect and carry home 150 spirals of different proportions and weights, so eventually every school supply list I sent out had “composition book” as a requirement. I started using one for my own writing, and I’ve never looked back. Now dozens of composition books sit on my office shelves, preserving my ideas and musings and messy drafts for days when I’m ready to revisit old thoughts and find in them new beginnings. Most of the posts in my personal blog come from composition books that I’ve gone back to and excavated. I try to teach my students what I’ve learned about “old” writing: that it’s worth keeping, a valuable glimpse into who we once were, and who we’re becoming. In fact, this post began in 2009 as a writer’s notebook entry. That summer, I sat on my back porch swing writing about the fun of having a brand new writer’s notebook, one with just the right cover, just the right pages, just the right look, weight, and feel. I’m glad I captured my thinking on that summer morning, and I’m glad I saved that old notebook. What do you look for in a writer’s notebook? Do you revisit your old writing? Share your thoughts in a comment here.